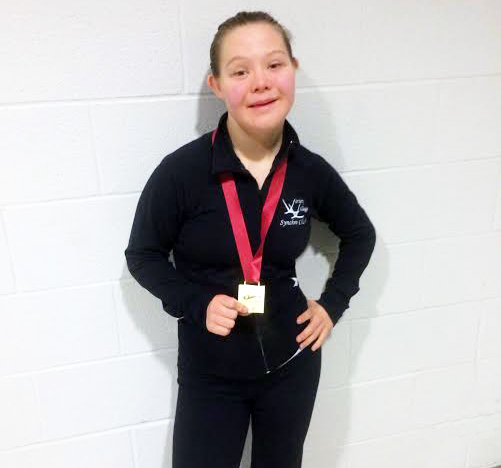 As an athlete who has Trisomy 21, Down syndrome, I attended my first Down syndrome International Swimming competition in 2012 in Loano, Italy and won the world gold for Canada. I was the only athlete to compete in synchro from Canada and the only athlete in the world to compete in both synchro and speed swimming. I won 2 silver and three bronze international medals in speed swimming. Our 4 X 100 m women's relay made a new America's record. In November of 2014, I plan to attend the world championships again, this time in Morelia, Mexico, where I will defend my gold medal. As the only synchro swimmer from Canada attending this competition, I am not only responsible for the cost of my travel and accommodation but that of my coach. I am raising money to cover these costs. My parents have mainly covered my expenses, but this year I am going to BC for the synchro National's and if I take just over one second off my breaststroke and butterfly I can go to CanAm's too - which means more money needed for travel! I train 6 days a week in two sports, that comes to about 20 hours a week. I am also taking courses on-line to earn credits for my high school diploma. In my spare time I take pictures of nature, and I hope to be able to get some good shots in Mexico, when I am not swimming. Please support me in getting to Mexico where I will be able to compete on equal grounds with people from all over the world who have Down syndrome like me. For $20 or more you will be sent a special edition nature photograph taken and signed by Nicole. For $40 or more you will be sent a 5 x 7 special edition nature photograph taken and signed by Nicole. For $60 or more you will be sent a 8 x 10 special edition nature photograph taken and signed by Nicole. All the best in Kamloops! Hi Nicole! We're cheering for you! Good luck and have fun! You are amazing! I know how much hard work you have put in over so many years, and every year you keep improving. I wish I could be there to see you swim!! All the best to you Nicole, you are amazing!!!! Wendy. You are a wonderful and talented young lady, and a great ambassador for Canada. We are looking forward to learning more about your accomplishments! We are proud to be part of your support team. Shawn and Nancy. We will always support what you do. Know you will do a great job representing us all. Way to go, Nicole! I wish you all the best. Nicole, you have tremendous courage. Keep dreaming big! All the best 😀. Do CANADA proud! Good luck Nicole.... the whole VVSC family is so proud of your accomplishments! Go Nicole!! We are rooting for you! All the best in the competition Nicole. You are an inspiration! Nicole, we know that you work very hard and diligently. all the best to your competition. we are proud of you. I wish I could travel with you to watch your solo and swimming events because I love to watch you swim. Best of luck and keep working hard. Nicole ,I am Liam's Howell's aunt and when I heard of your story I knew right away what I had to do. You are an amazing young woman. You were given a gift and unlike many of us, have found a way to use it. You are my hero. Enjoy Mexico and I am so looking forward to hearing more about your accomplishments. Uncle Jim and I are so proud of your dedication, commitment to your goals and look forward to you being on the podium! You Go Girl! All the very best Nicole. What an inspiring woman! Go Nicole! Nicole you deserve this success, I hope that support from everyone will allow you to accomplish your goals/dreams. Sending you love and continued success. So happy for you and I feel so proud to know you. Go Nicole Go! You are a wonderful ambassador for Canada. I hope to see your pictures in a gallery one day. Best of luck to a dynamic young woman! Congratulations Nicole on going for these amazing opportunities in your life! YOU are an inspiration to so many people. BEST OF LUCK with your fundraising ! Hi, Nicole! I hope you raise lots of money. We're all very proud to know you. For you Nicole- The world. keep up all the amazing thing that you do. Me and Andrea will always be there spirit cheering you on! Hoping you win gold again, Nicole!! On May 24th I made two new personal best times in 200m free and the 100 m IM. I love doing all the different strokes in the IM. This Sunday, June 1st, I am leaving for Kamloops to compete at ESPOIR for synchro. I have been working hard and am excited to travel. I can't wait to see the mountains, I would love to get a picture of a cougar! New personal best time and another gold medal! On Saturday I made a new personal best time in the 200 m IM with 2:10.59. That means I have qualified for another event in Mexico! On Sunday I performed my solo and got another gold medal. I feel strong in my solo and my speed is improving...I'm excited to go to Mexico! Nicole's new website is live! This weekend I won gold for my solo at the Hilton Invitational, I competed against athletes with a disability (AWD solo). I added another gold medal to my collection today for my solo. I swam to "Ho Hey" by artists Lennon Stella and Maisy Stella. Pass on my campaign information to everyone you know. Like my campaign my synchro year is off to a great start with two new gold medals at the regionals in Bradford on the weekend!